Triggers are the deviation of the analysts median forecast from the actual numbers. For the May 2017 Great Britain month over month Core Retail Sales numbers, the median forecast was -0.5%. That means any deviation of 0.7 or higher would trigger the BUY1 Action. Any negative deviation of -0.7 or lower would trigger the SELL1 Action. Any deviation of 1.2 or higher would trigger the BUY2 action. When this actual numbers came out at -1.2%, it instantaneously triggered the SELL2 action on the FX BOLT application. 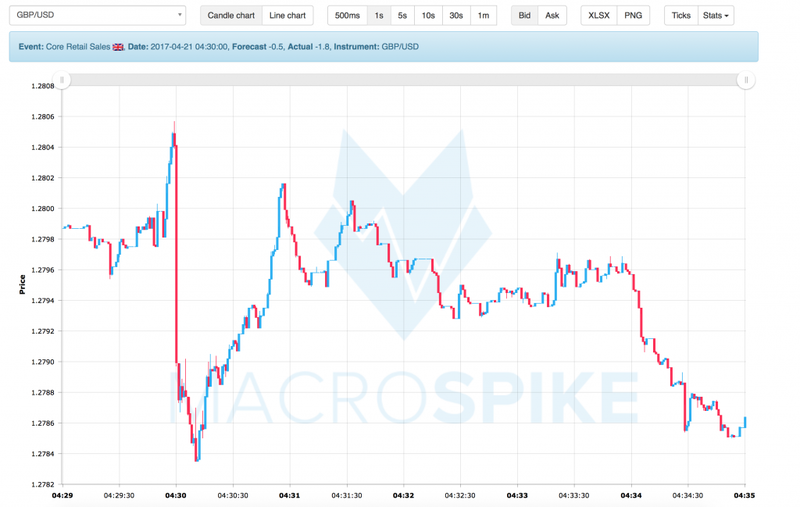 The worse than expected number lead to a hard sell-off of the GBP/USD.